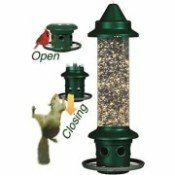 You get a lot for your dollar for the Monarchs and are an excellent mid-range priced bird watching binocular as well as being popular for other sporting activities such as hunting. The Monarchs have several different 2019 model lines including different magnification and objective lens sizes within the model type as well as lower and higher priced models depending on glass quality, lens and prism coatings. The Nikon Monarch Binoculars line now includes the Monarch 3, Monarch 5 and Monarch 7 models in addition to the Monarch ATB and Monarch X models. So now there are 5 Monarch models to choose from (not to mention each model has at least two magnification choices), but which one should you choose? What's the difference between all these models and price points? Let's try to weed through the confusion and make things clearer for you so you can make the best buying decision for your new pair of birding binoculars. Nikon's upgrades to models and name changes can be confusing, but we'll try to make things clearer for you. The Monarch 5 is what used to be called the Monarch III ATB binoculars with dielectric prism coating, not to be confused with the new Monarch 3 line. All you have to know that the Monarch 5 is one of the best selling lines of the Nikon Monarch models due to a combination of quality and price point value. It's what we personally use and recommend for a mid-priced birding binocular. The ATB designation of Monarch Binoculars (as well as some other Nikon binocular lines) stands for All-Terrain-Binoculars. They are 100% waterproof, fogproof and have shockproof rugged rubber-armored coating to withstand all the bumps and bruises of riding around in your vehicle and carrying them through all kinds of outdoor terrain. Nikon used to make cheaper, non-ATB models, but we see they no longer offer them and all Monarch lines are ATB. The most useful magnifications for birding and most wildlife viewing are the 8x42 and 10x42 Nikon Monarch 5 Binoculars because of the field of view and the weight which is heavier with larger objective lens size in the 8.5 x56, 10x56 and 12x56 ATB models (discussed later). What is the major difference between getting 8x vs 10x besides the obvious step-up in magnification? The field of view (FOV) is going to be wider with the 8x's which will make finding birds in your binoculars easier. The Monarch 5 8x42 FOV at 1,000 yards (or 1,000m) is 330 ft (110m) vs 288 ft (96m) in the 10x42. We believe the 8x42s are the best for a wide variety of birding activities. The Cornell Lab of Ornithology rated them as the best bird watching binoculars in the mid-price range. The 10x42s are a little more expensive because of the higher magnification, but will have a narrower FOV and less relative brightness. If most of your birding is looking at waterfowl, raptors and brighter light conditions and not so much trying to spot smaller birds flitting around in trees, like warblers, or low-light conditions, then you may prefer to get the higher magnification. The other major difference between the two is the eye relief which is 19.6mm in the 8x42 vs 18.4mm in the 10x42. Also remember that the 10x will greater magnify any shaking of your hands, so best to use in steady situations where you are not moving around a lot when viewing birds. But we know, some birders will always swear by 10xs no matter what. As you can see in the table below, what you gain in magnification with the 12x42 Nikon Monarch 5 binoculars, you lose in field of view, exit pupil size and a big loss in relative brightness. Again, for multi-purpose birding, we do not recommend this higher magnification. A better choice if you did want a 12x binocular would be the 12x56, but because of the larger objective lens size, the weight nearly doubles to 41.6 oz vs 21.9 oz in the 10x42 or 12x42. A 12x56 binocular is not going to be a comfortable binocular to carry around, so again, unless you are doing mostly stationary birding, go for either the 8x42s or 10x42s. The manufacturer suggested retail price points are ~$250 for the 8x42 model #7542, ~$299 for the 10x42 model #7543 and ~$329 for the 12x42 model #7544, although pricing will vary. The latest Nikon Monarch 5 Binoculars have the new dielectric high-reflective multilayer prism coating (DCF), for maximized brightness and higher resolution viewing, resulting in outstanding low-light performance. Phase corrected, Dielectric high-reflective multilayer prism coating for extreme brightness - especially good for low-light conditions. Fully multi-coated lenses for bright, clear images. Extended eye relief and smooth central focus for superior viewing convenience. Improved ergonomic, lightweight, slim roof-prism design for comfortable handling. Rubber-armored coating to protect against bumps and shocks. Waterproof/Fogproof because you never know! We have the 8xs and have written a review here Nikon Monarch 5 8x42 Review. Several of our birding friends have them as well and we all concur that this model has been one of the best birding binoculars we have purchased. All Monarch 5 binoculars compared below have the phase corrected, dielectric coating, fully multicoated lenses, roof-prism design and are waterproof, fogproof, and ATB versions with rubber armoring. Below are the 3 newest models of Nikon Monarch 5 Binoculars listed at Amazon which we have found to have the lowest price and free shipping. 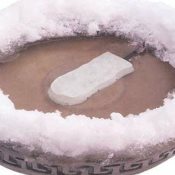 It's easy to place orders, track orders and return items so that is why we use them - plus they typically have the lowest price. 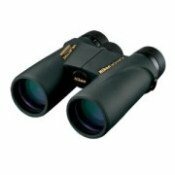 We checked and found that Optics Planet, Binoculars.com and Eagle Optics all had higher listed prices than Amazon for the 8x, 10x and 12x42 Monarch 5 Binoculars. "Very good binoculars, easy on the eyes because of the wide field of view, long eye relief and short minimum focusing distance. Note that when shopping for Nikon Monarch binoculars, sometimes it gets confusing because Nikon as well as other binocular merchants will use a mix of model names for the same model. Sometimes DCF is used instead of ATB or this current model will be called the Monarch 5, not Monarch ATB. I like Amazon because they use Nikon's model numbers, such as "7542" which denotes the latest model of the Monarch 5 8x42s so you know you are not getting an older model. The Monarch 3 is the lowest quality in the Monarch line, an entry-level binocular. It does have silver alloy prism coating which is a step above the usual aluminum alloy coating at this low, starting price point of $229 (8x42 model #7540/10x42 model #7541, $249). However with a close focus of nearly 10 feet, this is not the best birding binoculars, especially if you like to do a lot of backyard birding where you may be wanting to focus on birds at a closer distance. These would be a good introductory binocular for birding or hunting, but for $50 more, the Monarch 5 is far superior with the better dielectric prism coating and are lighter, have a smaller frame and a much better close focus. If you want to go cheaper instead of getting the Monarch 5 or any of the Monarch ATBs, then we recommend the Nikon Action Extreme Binocular line instead or take a look at the Vortex Diamondback Binoculars which are about the same price, but with a larger field of view and much shorter close focus. 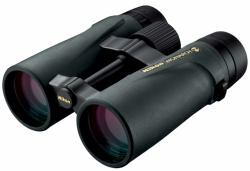 "These are one of the top binoculars recommended by the bird books. Just got a pair and they are great. The glasses are a bit large but not hard to carry or handle and the view and light gathering ability of the glasses is great. The ATB (All Terrain Binocular) term is applied to all Monarch lines - Monarch 3, Monarch 5, Monarch 7 and Monarch X, but there is also a separate line actually named "Monarch ATB". I have no idea why they want us to be this confused. Anyway, how are they different? This line offers different sizing in models than the other lines, notably there is not a size available with an objective lens of 42mm. These do have fully multicoated lenses and phase correction, but no dielectric coating as with the Monarch 5 line. Monarch ATB 8x36 Model #7513 $279.95 Good alternative option to the Monarch 5 8x42 binoculars if you prefer a lighter and smaller pair. Monarch ATB 10x36 Model #7514 $299 NOT recommended for birding binoculars because of the smaller objective size at this magnification resulting in a low relative brightness and narrow field of view. 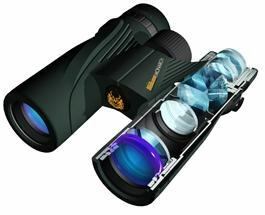 Monarch ATB 8.5x56 Model #7517 $419.95 Nice choice for dim-light birding. The larger objective lens adds more weight, but lets in a lot of light. Monarch ATB 10x56 Model # 7518 $449.95 Good balance of magnification and field of view if you want a 10x - however we still recommend the Monarch 5 10x42 over these. Monarch ATB 12x56 Model #7519 $479.95 Personally would not get these for birding because of the large size, weight and the extra magnification will make it difficult to find moving birds as well as hold steady without the shaking effect. Edit: The above ATB models appear to be phasing out of the Monarch line, but listed below are ATB models that are still popular in other sizes. Again the ATB line does not have the new dielectric coating as the Monarch 5 does so you will give up some brightness and clarity. I only see getting one of the above models instead of the Monarch 5 only if you really want a lighter binocular at the 8x magnification or prefer the larger 56mm objective lens to the 42mm. Otherwise, we highly recommend getting the Monarch 5 either in the 8x42s or 10x42s. You will pay around $200 more for a step up to the Monarch 7 binoculars over the Monarch 5 and comparable ATB binoculars. Because of the better prism glass - premium ED (Extra-Low Dispersion) glass and proprietary lens and prism coatings. This provides even better resolution and brightness to the birds in the field of view compared to the other Monarch models without ED glass. If you have an extra $200 to spend (over the Monarch 5 or ATB model lines), then I'd say the step up to ED glass would be worth it. If you do a lot of low-level light birding or think the brighter images will suit your eyes better, then you may want to consider the Monarch 7 for your bird watching binoculars. Basically if you want a pair of Monarchs with better optics and can afford it, then by all means get the Monarch 7. Retail Price: Monarch 7 8x42 (#7548) $479, Monarch 7 10x42 (#7549) $499. Very reasonable price point compared to competition with similar features and quality. "I gave these binoculars a 5 star rating simply because they are the sharpest clearest binoculars I have ever looked through and I have looked at some of the top of the line Swarovski and Zeiss binoculars which I thought I was going to end up with until I ran into the Nikon Monarch 7's. *Eco-Glass is made without the use of lead or arsenic. The Nikon Monarch X series is a step up in quality and price from the regular Monarch ATBs. They currently come in two sizes, 8.5x45 and 10.5x45. 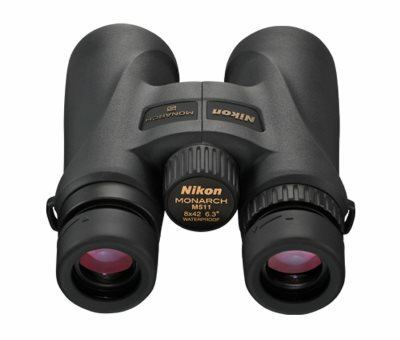 The Monarch X binoculars have the dielectric, high-reflective, multilayer prism coating that is used in the Nikon EDG binoculars, their high-end bins. Its main benefit is to bring in the most light through the lenses for a crisp, clear, bright image, especially at low-light conditions such as dawn and dusk. Nikon had hunters in mind as a marketing focus for this model, but hey us birders are up at dawn and sometimes bird until dusk too! The Nikon Monarch X binoculars, like the other Monarchs, are 100% waterproof, fogproof and have the rubber armor coating for durability and non-slip grip. It also has a new lightweight, ergonomic design for ultimate comfort in the hands and a unique thumb-position memory contours that form to your personal grip and provide optimum traction with soft-grip tactile surface. However, we say consider getting the Monarch 7 over the Monarch X if you are in the $450-$500 price range. All This Info is Great, But I'm Still Not Sure Which Monarch I Should Get?! For bird watching binoculars, the best bang for your buck at a mid-price range would be the Monarch 5 at either 8x42 or 10x42 (~$279-$299). If you want to go a little cheaper, then get a pair of the Nikon Monarch ATB 8x36 binoculars (~$249) or, as a second choice, the Monarch 3 8x42 (~$229) or Vortex Diamondback 8x42s. Here is a review of them vs the Monarch ATBs. For those on a tight budget, a great beginning birder binocular are the porro-prism Nikon Action Extreme Binoculars at either 7x35, 8x40 or 10x50 (~$135-$180). If you can pay more, then try Monarch 7 8x42 (~$479.95) or 10x42 (~$499.95). If you are a beginner birder, don't spend too much on your first pair. I would suggest spending no more for a mid-priced pair from $250-$300. Better Close Focus 8.2 ft vs 9.8 feet. "If your Nikon Binocular, Spotting Scope or Fieldscope requires service or repair not covered by our 25-Year Limited Warranty, Nikon will repair or replace it (even if it was your fault) for just $10, plus return shipping and handling." If you want to go a little cheaper, then you may want to try a pair of porro prism binoculars which the Budget Nikon Action Line Binoculars provides. They comes in both ATB and even cheaper non-ATB versions without being waterproof or fogproof. If you feel that you do not need the extra ATB features, such as using your binoculars the majority of the time from your backyard porch where being waterproof and fogproof will not be an issue and hopefully not having the added shockproof armoring either, then you can save a little and get one of the cheaper models. The Nikon Action porro prism binoculars are a little heavier and bulkier than roof prism binoculars and the line does not have as high, quality lenses as Monarchs, but the Nikon Action Extreme 7x35s were found to be the best cheap birding binoculars for under $150.